My press kit inside the artist goodie-bag I got yesterday seems to represent my split personality during Springdance. On the one hand I am being the objective journalist, writing my columns about the programme, atmosphere and side programme. On the other hand I am the dramaturge for Michael Pinchbeck’s End. Considered an artist, at least according to the batch I received with my goodie-bag, I morphed into another person in a split second. And is it not the task of the artist to present a subjective perspective on this world? Of course two issues come to mind straight away. Can I be objective whilst being commissioned by Springdance to write about Springdance? How can I be critical about my own commissioner? The other issue is the question what it is to be a dramaturge. Does my subjective view matter for the artist I am working with? Or should I be able to objectify my own perspective on the performance. Should I try to represent the audience that will come and see the show? In the end I prefer to mix up a clear subjective view with some elements, which I think are more objective. I try to use this approach in my writing, my research and my dramaturgical practice. Alternating in describing the subject matter and my own position in relation to that. I can’t help thinking of Simon Ellis’s Down (working title). Ellis, one of the participants in Europe in Motion, not only presented his solo performance, he also provided the context of this performance. From the introduction, where I imagined myself in his place, having just introduced Beginning Middle, End myself an hour earlier, to the reviews, audience reactions and even the specifications for touring. As an artist Ellis took the liberty to be lecturer, choreographer, dancer, critic, audience and PR assistant in one. Criticising both dance and the dance community, he shows, as the devil’s advocate, the ‘like knows like’ existence of this dance community. He left his audience powerless. Everything was already said. Interesting enough Ellis manages to represent several of my positions during Springdance & performance festival. And by doing this he got me thinking about my position(s) in this community. Beginning, Middle, End by Andrea Bozic, Julia Willms, Madalina Dan and Michael Pinchbeck tonight (April 23), 19.00h in Theater Kikker. 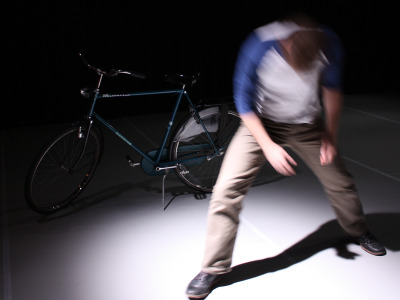 More Europe in Motion: April 23 and 24, 20.30h in Theater Kikker.